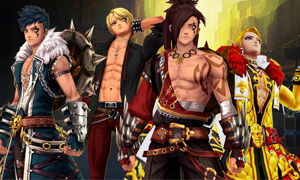 What is Kritika Online game? Kritika is an exciting action-packed hack-and-slash MMORPG based on both single-player adventure combat and teamwork-focused multiplayer action. At present, Kritika can be run on PS4, PC, and Xbox One, based on both single-player adventure and cooperated multiple player online mode. There are two versions of Kritika, one is Kritika Online (PC), and the second is Kritika: The White Knights, a standalone mobile game for Android/iOS. Eclair, Demon, Blade, Valkyrie, Monk, Dark Lord, and Vamp are the classes of Kritika Online, and you can establish several characters in one account to enjoy all classes simultaneously. Traverse the Alleytown, Deeprock Mine, Fountain Square, Keskyu Outpost, Opportunity Bay, and Starhenge with your Eclair, Monk, Gunmage, or Warrior avatar. Why should players buy Kritika Online Gold from Joymmo.com? All of Kritika Online Gold trading will be delivered directly to the in-game information you offered with many years' experience in game virtual currency business. Got any problem from buying Kritika Gold or in the game, 24/7 LiveChat online will help customers to solve it instantly.